I'm proud to announce I've been selected as a Platinum Award Winner by the AVA Digital Awards for Creativity in Video Production as Director of Portrait. I consider myself very lucky to be able to share stories of wonderful people like Andria and Cory, stories that reach and inspire tens of thousands of people. It wouldn't have been possible without the support of my wonderful Kickstarter backers, my wife, my mom, and my partner in crime in producing the project, Zach Frankart. Portrait was a passion project from the beginning, and I'm happy I was able to share that passion with you. AVA Digital recognizes outstanding achievement by creative professionals involved in the concept, direction, design and production of media that is part of the evolution of digital communication. 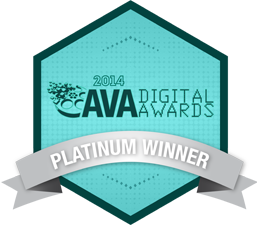 AVA Digital Awards is sponsored and judged by the Association of Marketing and Communication Professionals (AMCP). The international organization consists of several thousand production, marketing, communication, advertising, public relations, and freelance professionals. AMCP administers recognition programs; provides judges and rewards outstanding achievement and service to the profession. As part of its mission, AMCP fosters and supports the efforts of creative professionals who contribute their unique talents to public service and charitable organizations. The Platinum Award is the organization's top honor.